Ground covers do an excellent job at spreading around low-growing areas of the garden to produce a plethora of striking blooms. Some ground-cover vines are perennial and come each year to fill out the empty space and crowd out potential weeds in the garden. Some ground-cover vines have long blooming seasons that with a little deadheading, or removing of spent blooms, keep flowering into the fall and winter. For arid, hot climates, choose drought tolerant ground covers that are tough and hardy. Bishop’s hat is a moderate growing herbaceous perennial vine that grows between 6 and 15 inches tall and 8 to 18 inches wide. This spreading vine has a clump form and medium green, heart-shaped leaflets. Beginning in the fall, the green leaves turn a bronze and yellow for a fiery landscape. Bishop’s hat requires light to moderate shade and enriched, nutrient-laden, moist soil. This hardy perennial is also drought tolerant, ideal in arid climates where moisture is limited. The USDA hardiness zones are 5 to 8. Gold sedum is a rapidly growing evergreen ground-cover vine. Its low-growing mat form and open habit grows up to 9 inches in height and spreads up to 2 feet long. Beginning in the summer, gold sedum produces star-shaped flowers that are golden yellow in color and prolific bloomers. 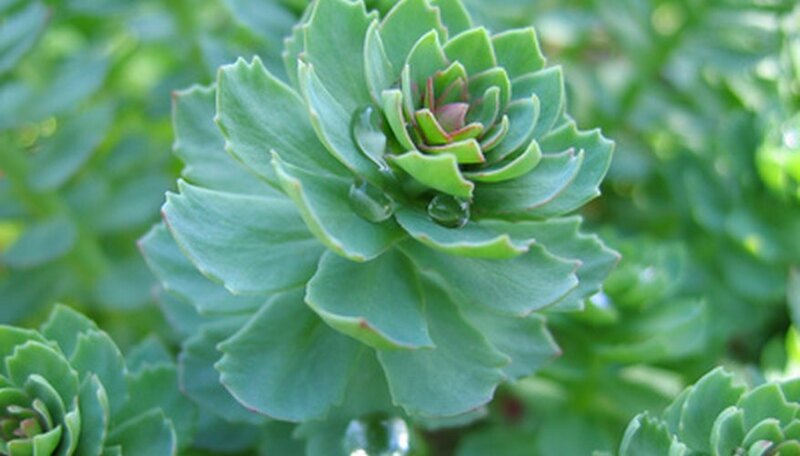 Gold sedum prefers full sun and well-drained, dry to medium soils. It is also drought tolerant and ideal along a rock garden or front flower bed. Beginning in the fall, the green leaves deepen to a bronze color. The USDA hardiness zones are 4 to 9. Creeping thyme is an herbaceous perennial ground cover with a low, mat forming shape. This hardy vine grows 3 to 6 inches high and spreads 6 inches wide. The bright green leaves on creeping thyme are shiny and highly aromatic. Starting in summer, creeping thyme produces purplish pink blooms that attract bumblebees. Creeping thyme is ideal edging a walkway or planted in containers for its draping effect. Creeping thyme prefers full sun to partial shade and well-drained soil with low fertility. Creeping thyme can also tolerate clay soils, if well-drained. This hardy grower is also drought tolerant. The USDA hardiness zones are 5 to 8. This low-growing evergreen ground-cover vine has spreading, horizontal branches that grow up to 2 feet in height and 3 feet wide. Creeping gardenia has medium to fine texture with a moderate to rapid growth rate. The thick, glossy green leaves range from 1 to 2 inches long and are oval in shape. Beginning in May, the 1-inch white flower emerges to light up this creeping vine. Creeping gardenia prefers full sun to partial shade and acidic soils. It is also heat and drought tolerant, making this hardy ground cover ideal for warmer climates. The USDA hardiness zones are 7b to 9.